I don’t know which is more difficult: The mental trauma Lara Croft is enduring after her hellish escape from a supernaturally cursed island, or trying to get details about the upcoming Tomb Raider sequel, Rise of the Tomb Raider. I’m pretty sure Crystal Dynamics and Microsoft are holding out for E3, but we haven’t even properly seen a game that is supposedly coming out this year. But hey, at least we know you’ll be able to stealth kill like a fish would. A brief Q&A session took place on the official Rise of the Tomb Raider forums yesterday, with some new gameplay details bubbling to the surface. The sequel to the stellar reboot a few years back retains most of the core gameplay, but fine tunes some of the smaller nuances that players, like you and I, found a little bit distracting. Like Quick Time Events for example. The Tomb Raider reboot was full of them, but the sequel promise to keep them toned down. For instance, mashing buttons to escape contextual attacks is not going to feature as prominently. And when they do, it’s not going to be some random button that you’ll have to quickly learn in the moment. It’s actually going to link up to the button press you’d expect it to be. The other thing we try to do with QTE’s is always make the interface consistent. Rather than mash a random button, you will have an exotic version of a core mechanic. So melee, for example – if you’re in a situation where you’re trapped but your hands are free, you might be swinging your axe with the Y button. That’s a normal mechanic done in an exotic situation. Exotic position, if you know what I mean, right? Another area where the sequel seems to be improving is stealth. Tomb Raider had some decent stealth implemented, but it more often than not relied on you having a handful of arrows in your quiver to quietly dispatch gun-toting maniacs. 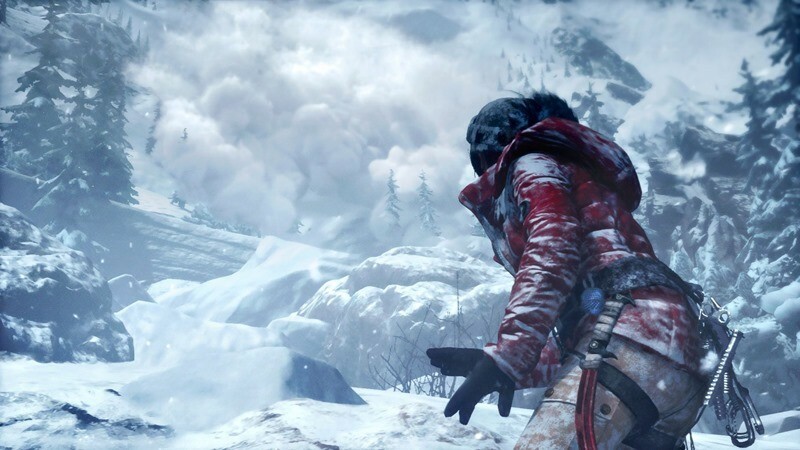 Rise of the Tomb Raider, however, will take a page from games like Assassin’s Creed. Lara can now use the environment to hide, with the ability to take out foes from trees, bushes and even while hiding underwater. It’s one button win stealth, as is the case in most other titles, but a marked improvement over the first. Your abilities for stealth combat will also be limited by your current weapon load out, which shouldn’t be that surprising. We’ve seen things like stealth kills from a bush in a number of games, but it starts to feel more Lara-like and survival-y when you’re doing take downs from the trees, or one of my favorites is the stealth kill from the water. These are all ways we have enhanced her core abilities to finish guys up close, especially as an extension of our new enhancements to stealth gameplay. Beyond that, the Q&A revealed that players still won’t be able to manually sprint, that damage will be visually represented as wounds on Lara (ew), and that the team at Crystal Dynamics is focusing heavily on contextualised animations to further immerse you in the harsh environments Lara finds herself in. We can probably expect a proper look at the game during Microsoft’s E3 conference, where I wouldn’t be surprised if a delay is announced for the timed-exclusive launch. Previous article Midweek Movie Mouth-off: Disney live-action remakes – yay or nay?